Kid Icarus opened in the summer of 2007 in Kensington right when I was scouring the city for a location for the workroom. I was thrilled to see such a great concept for a shop open up and even started looking at spaces in Kensington so that I could be in the same hood. It wasn’t until just a few months ago that I actually got to meet the duo behind Kid Icarus – Bianca and Mike. They are married, run two businesses, Kid Icarus & Studio XIX, and are just the nicest people. Bianca and I discovered that we went to the same tiny high school in Scarborough, so my admiration for them is firmly sealed. Kid Icarus will be joining us at the Garden Party Trunk Show on Sunday along with twelve other awesome vendors. I can’t think of a better way to spend the first day of summer. I’d love to know how it all started. What came first the business, your relationship? How did it evolve from a screenprinting business to a retail shop? Bianca : We met back in Spring 2002, we knew each other through the art scene but never really thought we would be working together five years later, We have now worked with each other for two years full time. But for five years prior, I had been helping Mike after work and evenings, so it feels like we have been partners for years. It takes two really strong, open minds to work and live together but we won’t have it any other way. Our line of Kid Icarus product has been growing over the past year. This not only includes greeting cards, but also stationery packs, wrapping paper and gift boxes. 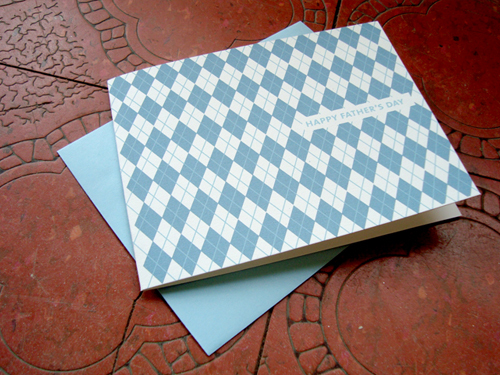 All our products are hand printed, folded and wrapped in our studio by hand. 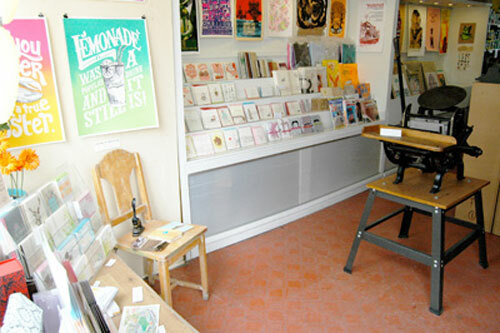 Michael : Studio XIX is our custom screen printing shop. I’ve been screen printing for bands and visual artists since 1999. I found that many people are unaware of what screen printing really is. There’s a fascination by the lack of machinery, and the whole handmade process that goes into this type of printing. In 2005, I decided I needed to expand onto a retail level. I wanted to be able to display what we were creating, and open the studio for the public to see. This is how the storefront/studio concept all started – to share my passion for screen printing in a public environment, and stock it full of things that myself and others had created by hand. In May 2007, Bianca quit her full-time job and we turned into a husband and wife work duo. Kid Icarus opened June 1st, 2007, and we haven’t looked back since. Bianca, can you describe Michael with 5 nouns? Michael, same question. Tell us about your neighbourhood, Kensington. Why did you choose this spot on Nassau for your shop? 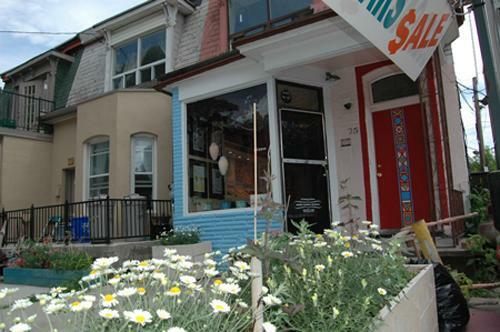 Michael : I cant imagine this store being located anywhere else besides Kensington Market. It’s often hard to explain to others what the store truly is, and in this eclectic part of the city, it blends in beautifully. Nassau Street is like a growing branch off the old Kensington path. Plus, with the cloud of gentrification looming over Kensington these past few years, it’s the only affordable place left in the market! Bianca : People who don’t know about the store easily miss it completely. We really love the ones who stumble upon us while walking around the hood. You can see the excitement build as their eyes widen and usually a conversation about what we do ensues. That’s when the neighbourhood and what we do is put into context, and it all makes so much sense. You represent tons of great local artists – who are the newest to your roster? Bianca : We are extremely pleased to have Old Weston‘s beautiful casted birds and acorn necklaces in our store. Her vintage bird necklaces has been one of our best sellers this spring. Lee Meszaros “Be Proud” Merit Badges. We can always find the perfect badge for all our close friends. We also have Dave Murrary’s “Kensington Market” hand printed silkscreen poster for sale at Kid Icarus. This poster is a visual word mark interpretation of Kensington Makert. Michael : And lastly we have to tell you about our newest line of “social emergency cards”. They are sold individually or in a box of 10 cards. The five cards are “Happy”, “Thanks”, “Sorry I…”, “Congrats” and “My Dearest”. It’s a multiple choice response card, where the sender can choose the best phrase for their particular situation. 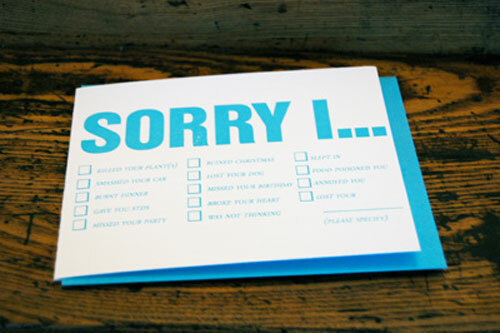 It’s incredible how many “Sorry I” cards we have sold. The Garden Party Trunk Show is the first day of summer. What do you love most about summer? Bianca : We love having a cup of coffee and sitting on our porch in the warm morning sun to wake up. Although it seems like we are always on the go, owning two businesses keeps both of us super busy all the time. We love the last Sunday of every summer month which is Kensington Market’s Pedestrian Sunday. We have been setting up a tent outside our shop and enjoying the festivities all day long. Michael : Swimming, bocce, Toronto Island getaways, going up north (and I don’t mean Vaughan). There is no way I can choose what I love most. Bianca’s answers are high in the list though. I had some posters printed there once. They did a fantastic job. i guess i know what store i’m checking out today. oh wow- this place looks awesome!! I have never heard of it. I am going to this store next week to check it out. Thanks so much for sharing. i’ve had my posters silkscreened there too and they did a great job. i kept on hearing about kid icarus through word of mouth…then recently i made a determined search for it and was amazed how many times i’ve walked right by! thanks for the interview – it’s great to attach names and personalities behind the shop.